Cover it all before fall or start now and trip your way into autumn along the Ice Cream Trail stretching from Lehigh to York and Lebanon to Montgomery Counties, across some of Pennsylvania’s most beautiful and historic preserved farmlands. Visit six participating creameries and receive a Pursue Your Scoops tee shirt. Visit all 12 stops along the trail and pick up a Pursue Your Scoops ice cream scooper. Download a VisitPA Passport and chart your ice cream experience to win tee shirts and scoops of ice cream along the Trail. Return your completed Passport to the Center for Dairy Excellence, 2301 North Cameron Street, Harrisburg, PA 1710 by October 31, 2018. Every summer, outdoor enthusiasts are reminded to avoid situations and conditions conducive to tick and mosquito exposure. Lyme Disease and West Nile Virus may be lurking from those nearly inevitable bug bites, according to the Pennsylvania Department of Health. Left untreated, both Lyme and WNV may lead to serious life-long health concerns including neurological conditions. Lyme Disease, caused by a bacteria, may begin with a bull’s eye rash, fever, chills, headache, fatigue, muscle and joint aches, and swollen lymph nodes. Following a two- to four-week course of antibiotics prescribed by a physician, recovery usually occurs quickly. Untreated Lyme may spread to joints, the heart, and the nervous system. West Nile Virus symptoms, typically last a few days, similar to the flu, may include a fever, headache, body aches, rash, and swollen lymph nodes. While less than one percent of those exposed to WNV will develop a severe illness, hospitalization for intravenous fluids, pain medication, and nursing care may be necessary. Symptoms may last for weeks and neurological effects may be permanent and severe. Healthcare facility complaints may be filed by calling the PA Department of Health at 1-800-254-5164 or completing the online form. Personal Care Home problems should be reported to 1-877-401-8835. Complaints about a medical professional, including doctors, nurses, and other healthcare professionals licensed by the PA Department of State should be submitted through the appropriate online form to initiate an investigation. Bow to stern and port to starboard, carefully examine your boat and trailer for any unintended, unwelcomed hitchhikers known as Aquatic Invasive Species (AIS). These non-native species damage the environment, economy, and our health. Environmental damage reduces availability of recreational opportunities, including swimming, fishing, and boating. The Eurasian water chestnut, innocently added to a botanical garden at Harvard University in 1877, today is established from Vermont to Virginia, as well as crossing the Canadian border into Quebec. The aggressive water chestnut creates an impenetrable mat restricting sunlight and producing a poorly functioning aquatic ecosystem. One hitch hiking water chestnut seed can produce 10 to 15 rosettes, each capable of producing up to 20 seeds, viable for up to 12 years in sediment, some of which will float away to wreak more environmental damage to Pennsylvania’s waterways. A more recent AIS to threaten PA is the red-eared slider, a turtle made popular by a cartoon and television show between 1987 and 1990. 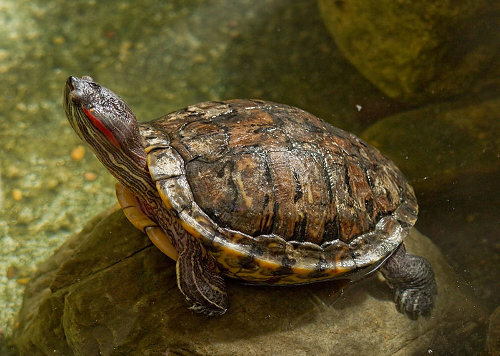 Purchasers accidentally or deliberately released the red-eared sliders into the wild, resulting in an ecological problem now considered one of the world’s worst invasive species. “On average, every 10 days a child dies from heatstroke in a vehicle”, according to Safe Kids Worldwide, (SKW) consisting of more than 400 U.S. coalitions, including Safe Kids PA, and representatives from more than 30 countries. AVOID leaving a child alone in a car. Lock all vehicles and store keys out of sight and reach of children. CREATE reminders, such as a stuffed toy removed from the child’s car safety seat and placed in the front passenger seat when the car safety seat is occupied by a child. Place your purse, briefcase, or phone on the back seat when a child is in the car. Create a drop-off reminder on your phone or computer calendar. TAKE action upon seeing a child alone in a car. Call 911 for trained emergency personnel to respond. Even at 60 degrees, a parked vehicle with closed windows becomes an oven in a matter of minutes. Throw in dark seats and the heating factor increases. In the nineties, a closed vehicle reaches 125 degrees within 20 minutes. During a span of 40 minutes, that same vehicle in 90 degree heat will reach 140 degrees. Tree bands are recommended from May through early November in the arsenal for containment and proper disposal of the Invasive Spotted Lanternfly, according to the Penn State Extension. From its 2014 discovery in Berks County, the Spotted Lanternfly infested 174 square miles in 2016 and more than 3,000 square miles of southeastern Pennsylvania by the end of 2017. The Spotted Lantern Fly is responsible for $18 – 20 billion in agricultural losses in Pennsylvania. Uncontrolled, the pest continues to threaten PA orchards, grapes, and logging industries.